Are your storyboards a little dull? Want to start storyboarding like a pro? Take a look at our Storyboarding Tips for Special Effects. Your storyboards will be forever changed! Since so many stories and comics center around dynamic characters, it is essential to convey the right emotions and actions in our storyboards. The drag and drop feature makes it super easy to get characters into your storyboards, but what do you do next? I have made many a storyboard in my time. Let me share some of the tricks I have picked up! Templates originate from builders and other craftsman who made forms and molds to serve as guides for shaping materials. Templates have since expanded to include document formatting, along with many other uses like printing and sewing. A template is a pre-formatted guide that can be used again and again. Blank templates for graphic organizers are especially useful because you do not need to recreate the same thing over and over, and they can be used for many purposes. One feature that many users are unfamiliar with is the ability to create Holiday Cards! Find out what else you have been missing out on! One of the coolest features on Storyboard That is Smart Scenes. 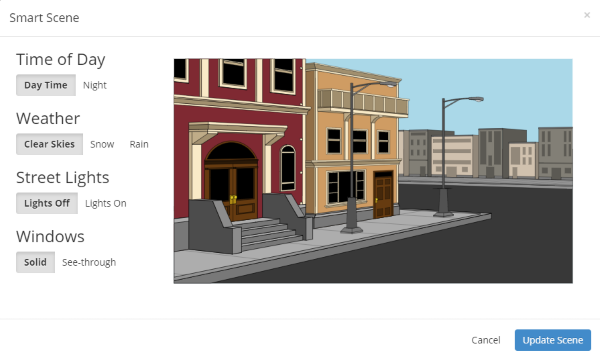 Essentially, Smart Scenes enable the user to customize the scene in a variety of ways - from the weather to the time of day. Now, you can customize BOTH characters and scenes to make sure your storyboard is exactly how you want it. Incorporating a three-dimensional property like depth into a two-dimensional plane (a storyboard for example) can be difficult, but there are some tips and tricks to help create the illusion of depth. Depth is always illusory in a 2-D space (photos, drawings), which are flat. Our brains are built for 3-D environments though. They take cues from lighting, shadows size, and angles in order to interpret our distance to objects, and we can apply these tricks to a 2-D medium with perspective, thereby tricking our brains into seeing distance and depth in a storyboard. Every great storyboard needs to start somewhere, and that somewhere is with a great layout. There are many things that go into making a storyboard excellent, but it always rests on its foundation: the layout. You’ve made a storyboard for a project, assignment, or idea and yet something seems to be lacking. You’ve got a great story and covered all the topics you need, but you still have this feeling that it could be even better. Look no further! This article will teach you all the tips and tricks you need to make your storyboard the absolute best it can be!